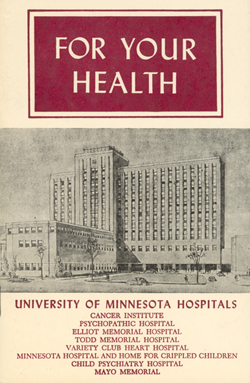 The University of Minnesota Hospitals was established for the welfare of the state – and thus for your welfare. 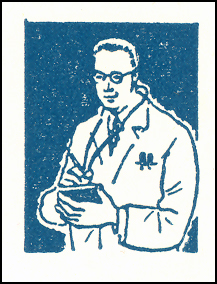 So begins the introductory remarks of the patient pocket guidebook “For Your Health” given to each one of the estimated 13,000 annual patients treated at the University Hospitals in the late 1950s. The pocket guide gives information on hospital meal times and local area restaurants, visiting hours, billing and insurance, and what to expect when discharged. The guide also explains the roles of individual staff members including doctors, medical students, nurses, dietitians, medical technologists, occupational and physical therapists, and social workers as well as what services to expect during a stay ranging from TV rentals to appointments with a visiting barber. The language and illustrations of the pocket guide differ from today’s approach to educate visitors about the hospitals and clinics. Even the media has changed to online virtual tours to educate patients and families about what to expect. Browse through the pocket guide “For Your Health” below. After materials arrive at the archives (Part I. Sending Materials to the Archives) and undergo a physical arrangement process (Part II. Initial Processing and Physical Arrangement) the collection is accessioned into the archives and a description of the materials is written to aid collection management and researcher access. Accessioning is a formal process of taking physical custody of the materials and recording the date the materials arrived, contact information for the donor, the size of the collection upon arrival, a brief description of the materials, and any special considerations or needs that the collection will require during processing. The description process is primarily the creation of a finding aid for the collection. Finding aids are an archival tool that attempts to facilitate access and explain the materials in their historical context. In its most basic form, finding aids provide easily readable summarized information about the collection. More detailed finding aids act as an outline for the collection and allow researchers and archivists to learn more information about the materials before looking in the boxes. Older finding aids (pre 1990s) are often typed sheets of paper. After the introduction of the desktop computer and the WWW to the archival work flow, finding aids were written in popular desktop publishing programs and made available online using html markup or PDFs. 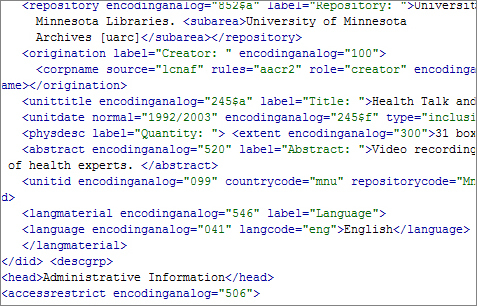 By the late 1990s, archivists developed an encoding mechanism using SGML and later XML to create a standardized structure for electronic delivery. The standard, known as Encoded Archival Description (EAD), is commonly accepted as the preferred professional description format and allows finding aids to be discovered using popular search engines (Google) and library catalogs. 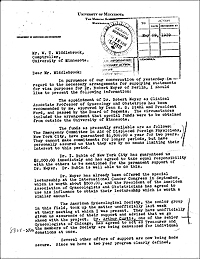 The material collected and described through the AHC History Project will follow these professional standards and will be available for users through either the University Archives web site or the University Libraries’ online database for University of Minnesota finding aids. Paper copies of all finding aids are also available at the University Archives for in-person use. At this point, after accessioning and description, the materials will be physically stored in the caverns beneath Andersen Library. When a person identifies materials through the use of a finding aid or through a conversation with staff members at the archives, the boxes will be pulled and brought to a secure reading room for use.